Some picture of what is left of the windmills in and around our village. The remains of the last working corn mill of Mattishall, derelict by 1916. Looks quiet sad doesn't it?. Situated just off Mill Street. The old mill in Mill Road owened by Donald and Margaret Fisher has been restored into a holiday home. Honningham mill was turned into a sizable dwelling within the last few years. Finally Dereham mill restored to it original glory a monument to how the previous mills would have looked in their prime working days. It was again for sale in 1813. From 1815 the post mill was owned by members of the Toffts family, James, John and Mrs. Mary Toffts, till Richard Sendall bought it in 1840. He kept it till 1855, when he sold it to Matthew Yull, a local farmer. In the meantime it had had a succession of tenant millers, Christmas Fulcher, William Neve, Archibald Brasnett, Levi Reynolds and John Sendall. By July 1856 whilst in the occupation of John Sendall it had been demolished for some reason or other. All that piece of Freehold Land containing la. Ir. 25p. abutting-on the road leading from the Mattishall Turnpike to North Tuddenham with the five floor Tower Windmill, excellent Granary, 2-stall Stable, Hay house and Cart shed which have recently been erected thereon in the most substantial manner. The Mill is fitted up in the most complete manner with two pairs of French Stones 4 ft. 4 ins. and 4 ft., new machinery for wind and steam and is now in full work. Mattishall, Mill Road Mill 1972 The two-storey stump, which is all that remains of the five-storey tower mill built around 1857/8 to replace a post mill. William Critoph of Yaxham tower mill was working it. In October 1889 the mill property together with the farm which included land in Westfield and Yaxham was once more put up for sale by the Mortgagees, but appears not to have been sold, as in October 1890 it was again auctioned. The mill was then in hand and no longer being used and was bought by Isaac Fisher, who had the present house built there. 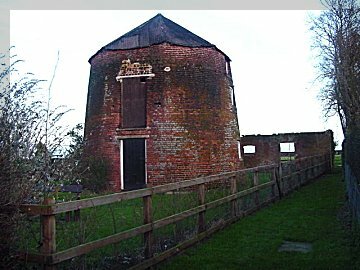 The top of the mill was blown off about 1893 and some of the material went to repair the Mill Street tower mill being worked by William Lant Duffield. The mill was finally dismantled about 1900. No photograph of the mill in working order has yet been located. 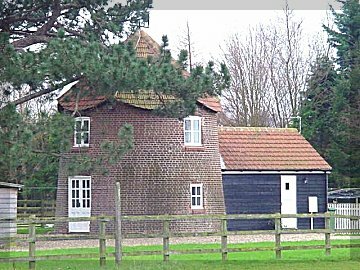 MATTISHALL'S other brick tower mill was built in 1862 for Edward Sendall, to replace his smock mill on the same property, perhaps in order to compete successfully with Matthew Yull's new tower mill in Mill Road. All that newly erected and substantially built Brick and Tiled MESSUAGE situate in Town Lane in Mattishall aforesaid with the Yards, Gardens, Stables, Hay-house, Cart Lodge and Store-house adjoining; and all that substantially built SMOCK TOWER WINDMILL driving two pairs of stones, with the flour mill, sifter and all requisite machinery in excellent condition, situate adjoining or near the said dwelling house, comprising altogether, with the site of the Buildings One Rood, more or less. Freehold. This mill was built in 1862, replacing a smock mill. The inner stock appears to be flexing, which is a sign of weakness. Apply to Mr. Drake, Solicitor, to Messrs. Cooper & Sons or to the Auctioneer, East Dereham. The mill was not sold then, but was again advertised for sale, this time by private contract, in October 1857, when it was bought by Edward Sendall, who had been working it. By April 1861 it was no longer working. Mr. HORACE M. WILKIN, by order of the Mortgagees with power of Sale, at the King's Arms Hotel, East Dereham at 3 for 4 o'clock on Friday, 29 September, 1876. All that Freehold MESSUAGE or TENEMENT with the Stable, Hayhouse, Cart lodge, Storehouse and other Outhouses, Yards, Garden and Land to the same belonging and adjoining, situate in Mattishall and also all that Freehold BRICK TOWER WINDMILL standing on the said land, with the going gear, Machinery, Sack tackling, Mill Stones, Flour Mills, Sails and appurtenances thereto belonging, as the same premises, containing together one rood (more or less) and are bounded by Land belonging to - Dobbs towards the North and South, by Land belonging to John Lodge towards the East and by the public road leading from Mattishall to Welborne towards the West, and now in the occupation of Mr. George Reeve and Mr. Thomas Sendall. No sale seems to have resulted as the mill was advertised several times by the Mortgagees till 1889. In 1883/84 David John Reeve was miller, followed by Edward Sparks, 1886, 1. W. Rix 1888 and J. C. Millett in 1889. 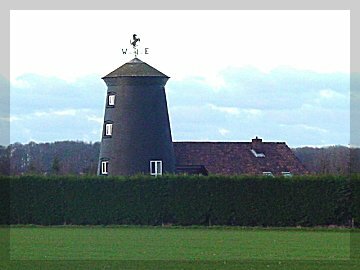 William Lant Duffield, who had been employed at Mulbarton Common smock mill took the mill in 1893 on a four-year lease, starting in business on his own account. He said the mill was a fine one having six floors and plenty of sail - 30 ft. by 9 ft. each, driving two pairs of stones. He sold all English flour in 5 stone lots at 1 s. per stone. In 1895 he was buying barley for grinding at 10s. per quarter and selling the meal at 6d. per stone (1 quarter = 32 pecks or stones). 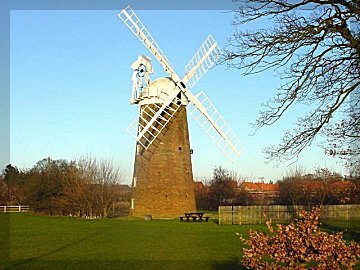 The mill had been out of use for about two years, but after repairs to the sails and the replacing of one millstone, he got it working again. In 1896 he returned to Tasburgh watermill, where he had been apprenticed and in 1906 hired Saxlingham Thorpe watermill, founding the present firm of W. L. Duffield & Son, Ltd. 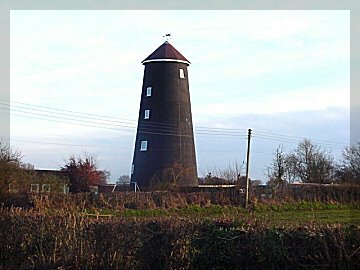 He was followed at Mattishall by James Doughty in 1900, William West in 1904 and William Fendick (3), who had come from the Norwich Road tower mill at Dereham in 1908. He had left Mattishall and was at Honingham watermill by 1912. The mill was already derelict in 1916 when the sails were blown off. 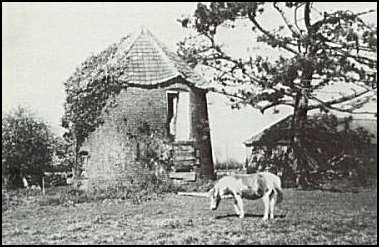 By 1937 the tower had been cut down and roofed over similar to the Mill Road tower. TG 04851100. (Faden's Map 1797) post mill? Born at Manor Park, Essex in 1904, Harry Apling soon moved to Ilford where he attended Christchurch Road School and the County High School, leaving there in 1920. Ever since 1908, family holidays had been taken at Hingham in Norfolk, with a visit to the windmill there in 1911. Joining Barclays Bank Limited in London, he was transferred to Norfolk in 1922 at his own request. In February of the following year, he was moved to the East Dereham Branch for four years and, after a few years service at Attleborough and Norwich, he returned to Dereham in 1934. Since childhood he had been interested in coins and on coming to Norfolk also took up prehistoric archaeology. Windmills formed part of his rural colour photography and, in 1958, he bought his first book on the subject. 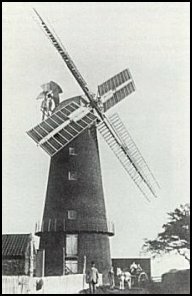 However, finding that there was no detailed account of Norfolk corn windmills, he started building up his own filing system, later collecting photographs and other information for a time. This, then, is the written up result, at least the first volume of it, dealing only with those mills of which anything at all still remains.